We hope you enjoy this update, and if you have any new feature requests, please let us know on our UserVoice site. Many users spend most of their time in full screen mode, either because they are doing presentations, or because they are taking advantage of the URL parameter ?chromeless=true. And now you can print too without having to exit full screen mode first. Simply move your cursor to reveal the menu overlay. When you select the Print option, your browser’s print window will open. 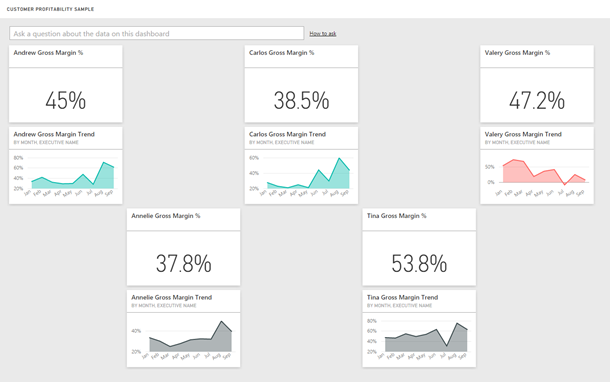 We have heard from many users that they use full screen mode to present their dashboards in meetings. Full Screen works well for many dashboards, but not all. To address this, we’ve added another option to the full screen mode overlay: Fit to Width. Fit to Width expands your tiles to fill the entire canvas. This is useful for those dashboards that are taller than they are wide. For example, in Full Screen mode, the dashboard below has a lot of empty space to the right and the tiles are too small to be seen in the back of the room. Fit to Width expands the tiles so they fill the width of the screen, making it easier for everyone in your audience to see your data. Since November of last year, you have been able to freely position tiles on the dashboard. However, some users want their tiles to always look orderly and positioned together as they work. To do this, we have added the ability turn on tile flow for a dashboard, which automatically aligns your tiles to the top left corner of the canvas. To turn on Tile Flow, select the ellipses next to the name of the dashboard and select Settings. 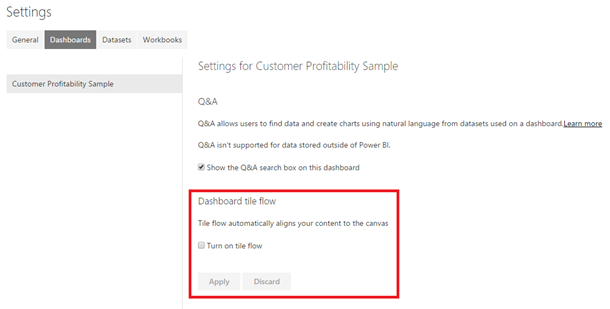 From the Dashboards tab, find Dashboard tile flow and select Turn on tile flow. Before you turn on tile flow, your tiles will stay where you put them. After you turn tile flow on, they will all align to the top left of the dashboard. 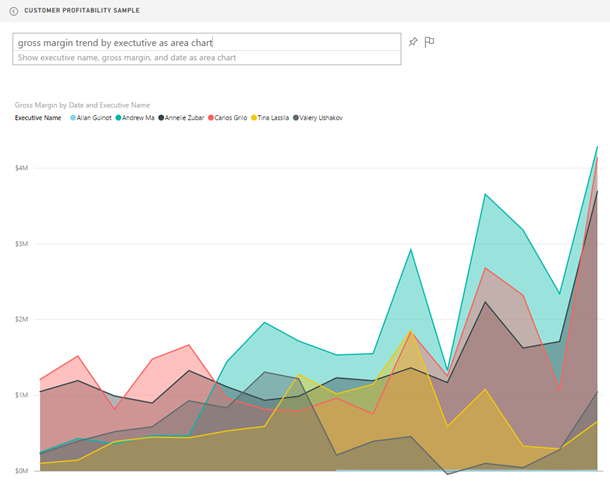 Quick Insights lets you quickly and easily find trends and correlations in your data. 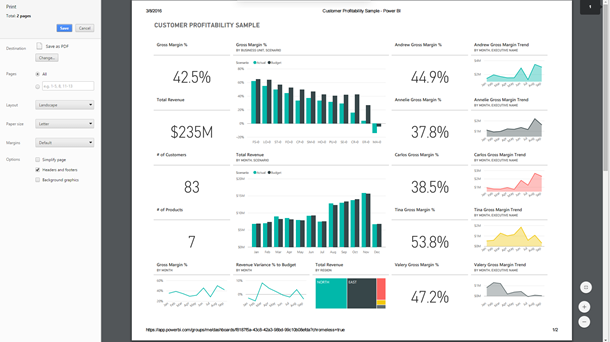 This enables anyone, even those who aren’t inclined to build reports, to discover new things about their data and empower them to make business decisions based off these insights. 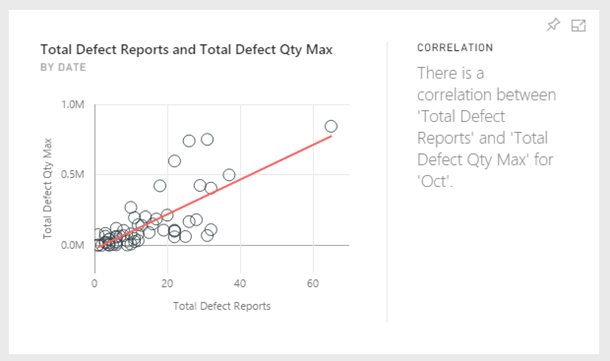 We’ve enriched 2 of these insights, Trend and Correlation, by adding a trend line to make them even more intuitive so you can quickly spot the meaning behind the data. Q&A is another easy to way to find insights in your data; all you have to do is ask a question! 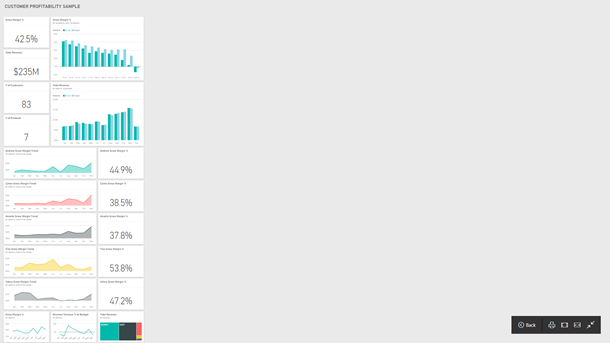 When you ask questions in Q&A, we automatically give you answers using the visual we believe best shows the data. However, if you have a certain visual in mind you can always specify it by adding “as bar chart” (or any other visual type we support) to the end of your question. Previously we didn’t support this feature with the gauge or area charts, but now you can use those right alongside any of our other visual types. To use these visuals, just add “as area chart” or “as gauge” to the end of your question. We are continuously improving the user experience in Q&A and one of our recent improvements is to the auto-complete experience. Now when you start typing your questions into Q&A, you will see auto-complete happening after just a few characters. Additionally, we will suggest visuals for you to change the visual type to after you type “as” at the end of your question. That’s all until the Data Insights Summit. Don’t forget to check back on March 22 and 23 for some exciting news! 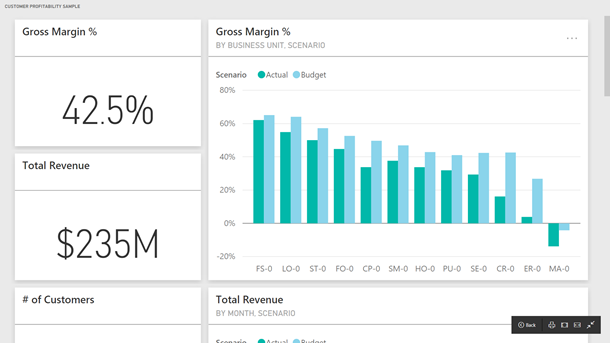 And in the meantime, please vote for other features that you would like to see in the Power BI service in the future.